Here's something a lot of people don't talk about when they talk about pregnancy and childbirth, and there's not a lot that can prepare you for it: recovery. There's a heck of a lot of stuff that happens after that baby is born. Now, every woman's recovery is different (just like every woman's pregnancy is different), but I really had no clue that the recovery would be as difficult as it ended up being with my first child. I often wonder if a lot of my problem didn't stem from the fact that I had that Strep bacteria that required the docs to give me antibiotics as soon as I got hooked up to the IV, and they gave those antibiotics pretty much the entire time I was on the IV (so at least 10 hours). It pretty much cleaned out my entire system. After Taylor was born I had a really hard time with my nausea and lack of appetite. I knew I needed to eat, but I had such a hard time forcing any food into my system. When I don't eat, I get nauseous. So between not eating and having already had my system cleaned out, I was a mess. Add on to this all of the breastfeeding problems (see Breastfeeding), and it was a recipe for a really tough recovery. When I finally got my appetite back, I started to have horrible, painful gas. This was not flatulence gas, this was making-your-chest-constrict-so-you-can't-breathe gas. It was just so painful. I would call the doctor and ask if there was any kind of prescription for the gas, and they would always say "water, walk around, avoid gassy foods, and call if it gets worse." I would say, I have done all of the gas things you're supposed to do, and it is worse!! No dice. I just had to live with it and eventually after about two or three weeks it did improve. it was really at least two week of nausea followed by two weeks of painful gas. I was at my 6-week follow up still feeling pretty miserable. I tend to think that at the time I was probably having some postpartum depression that we all thought was just a normal part of the recovery. I often think of the first 4-6 weeks of Taylor's life as "a very dark time," which I'm pretty sure is a sign that I was depressed. And here's another thing that is not often discussed. Breastfeeding (or pumping in my case) can cause some women's estrogen levels to diminish, which can result in really painful intimacy. This happened to me, and I spent probably 2 months thinking there was something wrong with me emotionally, when, in fact, it was this relatively common physical problem that some women have. They have pills and creams that can help with that, if you seek help. 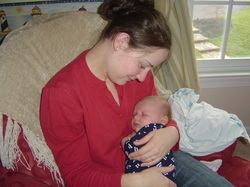 Of course, there are a lot of wonderful moments when having a child and then nurturing a newborn. I struggled with the breastfeeding, and I struggled with the recovery, but of course that doesn't diminish my love for my child. And I think that was something that actually took me a little while to understand and accept. It doesn't make me a bad mom to know that I had a hard time becoming a mom. It makes me a real person, and it helps make my love for my child more real. I didn't go through this experience alone, either. I leaned on my family a lot. And that also reinforces the importance of the family bond for me, both in terms of the family that I was born into, the family I've gained with my husband, and the family that he and I are creating. We have real love for each other, love that is sometimes hard but that is constant and is constantly rewarding.